For a short but rewarding detour from the Glenn Highway, take the Eklutna exit and follow the signs to Eklutna Village, just north of the road between Peters Creek and the Knik River. Eklutna has been continuously occupied by Denaina (or Tanaina) Athabascan Indians since 1650. The town is located at the junction of several traditional Indian trails, including the Iditarod. Russian trappers and mission-aries arrived in the late eighteenth century. Today, Eklutna Village Historical Park, www.alaskaone.com/eklutna, is operated by the village corporation, Eklutna Inc. The Eklutna Village Heritage House offers local arts-and-crafts items for sale and provides access to outdoor exhibits for a small fee. Outside is the small Saint Nicholas Russian Orthodox Church, the oldest standing structure in the Anchorage area. It was originally built in the 1830s and refurbished in the 1970s. 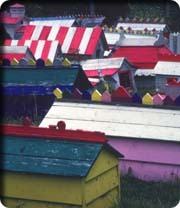 Nearby are several colorful Spirit Houseselaborately decorated ?houses? placed by the Dena’ina over the graves of relatives. For information, contact: Eklutna Village Historical Park, 688-6026. Small admission fee for spirit houses and church.